A 64 page book explaining Vince Gironda’s concepts of exercise and nutrition. 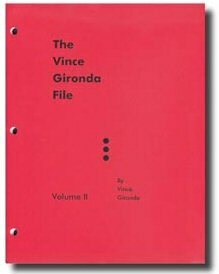 The Vince Gironda File II is another excellent text. Essentially, file II expands upon its predecessor adding additional detail. Also, the question and answer section at the end of the file proved most informative. It should be noted file I is not necessarily needed in order to read file II, however, I recommend both. Another great read!